Theater in the Now: Review: I Love the 90s! Review: I Love the 90s! The decade you grew up in is automatically the best. It had the best music, the best tv shows, the best clothing. It's just the best! We love our decades so much we always try to pay homage to everything that made it so sweet. In Hey 90s Kids, You're Old, a bunch of 90s kids bring 90s infused sketch comedy to life in a mixed bag of funny. Created by Taryn Parrish, the Canadian sextet that comprise Hey 90s Kids offer a series of sketches that bring the audience back to a time before social media and iPhones ruined lives. To set up the evening, musical nostalgia was the preshow ambiance, with a range of infamous 90s theme songs. Once the action gets started, that’s when some of the funny begins. Sketch comedy is a hit or miss type of thing. It comes with the territory. With a specific generation to draw from, Hey 90s Kids gets the best of both worlds. 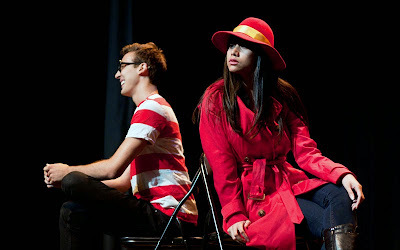 The strongest sketch was an online conversation that occurred between the notorious personas that are frequently being searched for, Waldo and Carmen San Diego. The conceit was hilarious and quite inventive. The other strong showing was a sketch surrounding Pinky and the Brain AFTER they’ve taken over the world. The one recurring sketch surrounded a date between a modern girl and a guy who’s stuck in the 90s. Unfortunately it fell flat as it was a sketch that relied to heavily on references, many of which were unseen. It was a gag that went on too long. Like the sketches, the cast was filled with some good, some bad. The standout of the bunch was the chameleon-like, larger-than-life Alex Steele Zonjic. Appearing in the strongest sketches as well as being the focal point in the opening music montage, Steele Zonjic went big and his choices paid off. Hana Holubec was another strong player, jumping from the more “straight guy” role in the Power Rangers sketch to the big character in the 90s party sketch. Holubec had quite some range. Simon Lee as the new gay hipster intern fit the witty punch line well. For the most part, the actors lived in a black base costume. For some of the characters, Where’s Waldo, Carmen San Diego, Pinky, the Brain and Mario to be exact, their iconic costumes were used. And that’s when the funny landed best. The same goes for the lack of props and scenery. In the recurring sketch of the date gone badly, there is reference after reference of 90s item yet it’s all mostly mimed, sans car phone. Without props, the actors are forced to namedrop which loses the punchline, the items themselves. Sure a magic drawer of Beanie Babies could be hard to recreate but seeing them and not saying anything would draw a much bigger laugh. While the comedy was funny, it definitely reaches a certain demographic best. Those of us who knew the reference laughed, or groaned depending on what it was. Those who didn’t may not have felt “in” on the jokes. Nevertheless, like all sketch shows, highs and lows are inevitable. It comes with the territory. But when Hey 90s Kids, You’re Old does hit those highs, they deserve all the laughs.